In addition to GetRealtime for downloading free hydrological and meterological web data and simulations. ... here are some more free downloads for hydrologists and others. 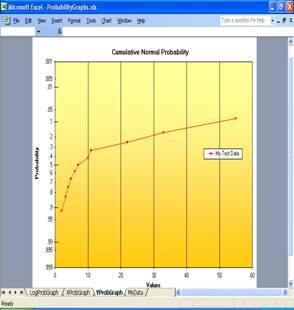 1 Excel GetRegression.xls--regressions, interpolations, probability, Pearson. 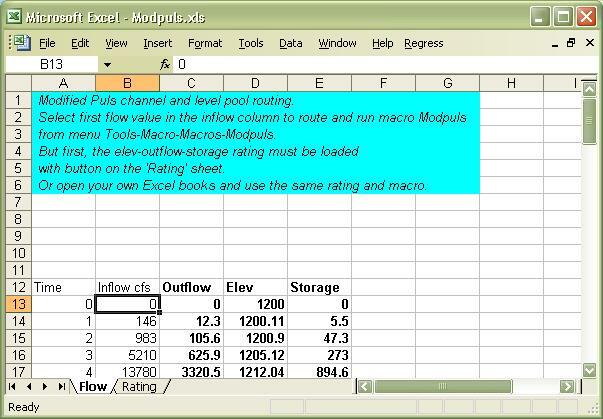 3 Excel Example with GoalSeek/Tips--in stock pipe sizing example. 4 GetMapArea.exe--digitize screens of topos, Google Maps, etc; also computes runoff with routings. 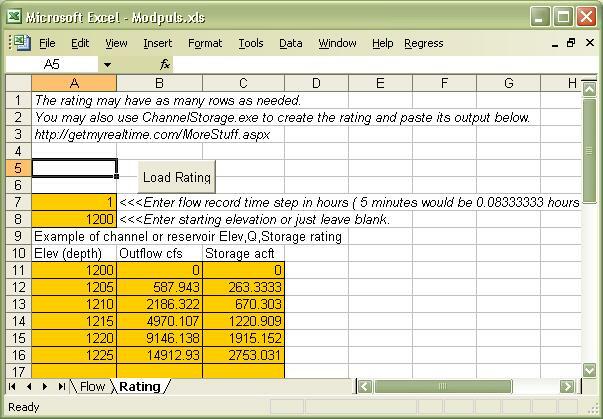 5 Excel GetFlowRecord.xls--complete system for maintaing a streamflow record and database. 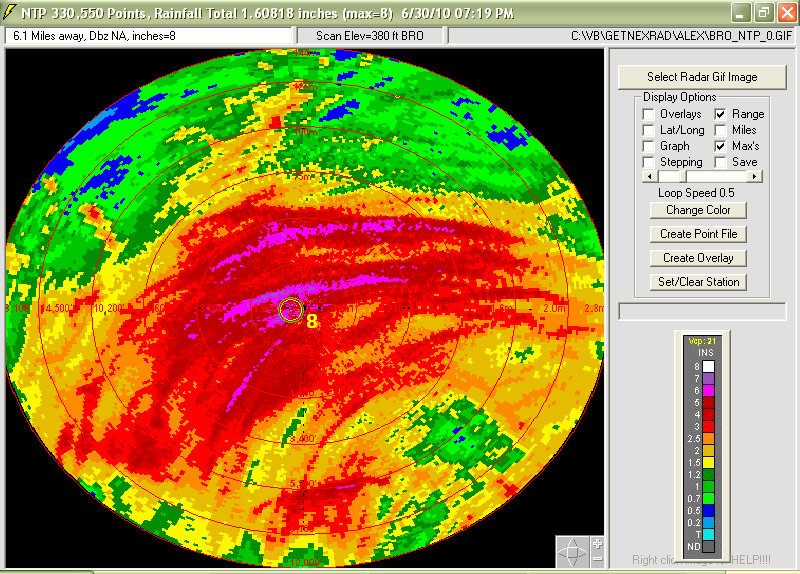 6 GetNexrad.exe--view Nexrad radar loops and compute point and area rainfall. 7 VolumeTimer.exe--turns down PC volume during commercials. 8 CookingTimer.exe--simple timer with notepad for keeping notes on times/recipes. 9 ChannelStorage.exe--creates normal depth trapazoidal channel elev, flow, volume rating. 10 ModPulXsec.exe--creates normal depth channel rating for Modified Puls and Muskingum-Cunge from typical x-section station, elevation pairs w/Heatherman's optimal number of cascading reservoirs..
11 Excel ModPuls.xls--routes column of flows in Excel. 12 HurricaneAlex2010Gifs--Radar image files of Hurricane Alex as it came ashore June 30, 2010. 14 Topo Maps on Google Earth--Best topo map tip since the invention of the theodolite. Also HUC's. 15 ExampleXLrangeToGif.xls--Convert an Excel data range to a Gif file and FTP to your web host. 16 May 20, 2013 Oklahoma Tornado Level 2 debri ball and hook echo sequence. 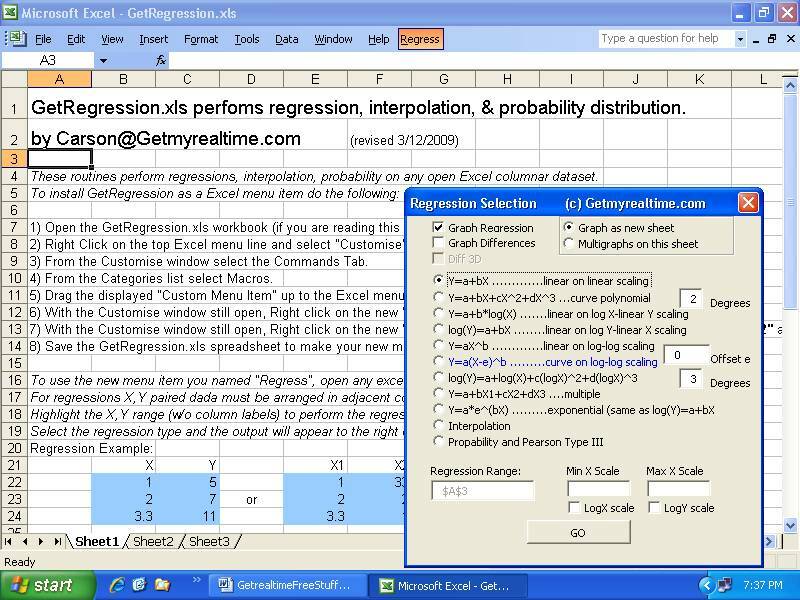 1) GetRegression.xls--(revised Sep 1, 2017) MS Excel menu macro for quickly computing/graphing regressions, interpolations, and probability distributions on any Excel sheet. 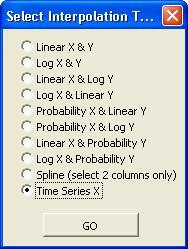 Includes Y=a(X-e)^b used in sediment and streamflow ratings where 'e' is the offset or point of zero flow. 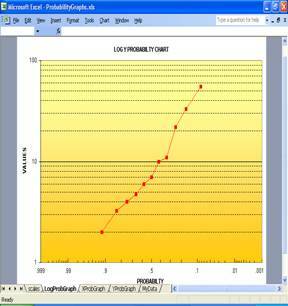 2) ProbabilityGraphs.xls--MS Excel workbook for creating probability charts. You might not have use for this xls if you added the the above GetRegression.xls to your Excel Menu bar.... but I could be wrong. 3) Great Looking Excel Tips--Examples and videos for creating most excellant Excel spreadsheets by a pro at CSU. I attended one of his workshops years ago and it opened my eyes to the world of Excel. Beginners to experts will find his stuff very useful and for adding that finishing touch. Be sure to play the video links over on the right of his web page. Dr Fontane will be adding more examples soon as his work load allows so stay tuned. MS Office 2003 users can still open his downloads. Just follow his tip at the top and Excel will prompt you do install a free update for reading 2007 files. 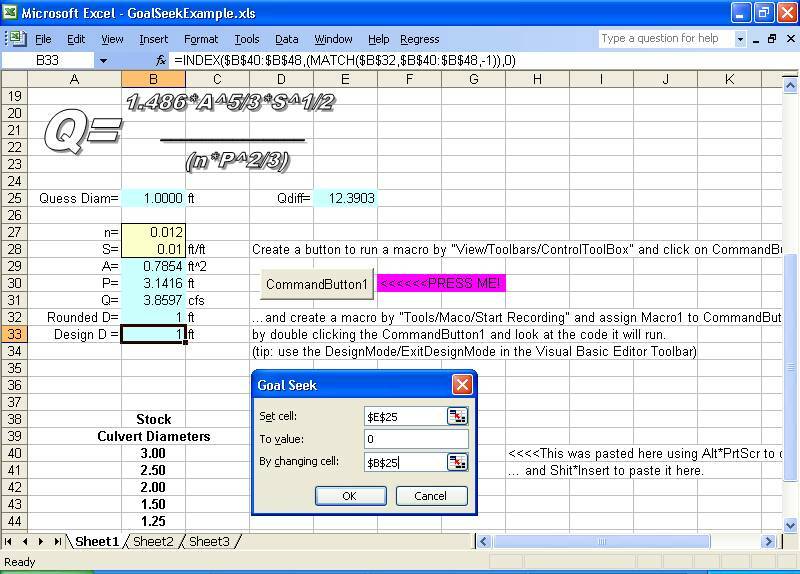 3) Excel Example with GoalSeek/Tips--Example worksheet using a command buttton and Excel's built in GoalSeek to solve Mannings flow equation area given flow from the Rational runoff method. Tips include function Index() for looking up values for culvert sizes in stock. 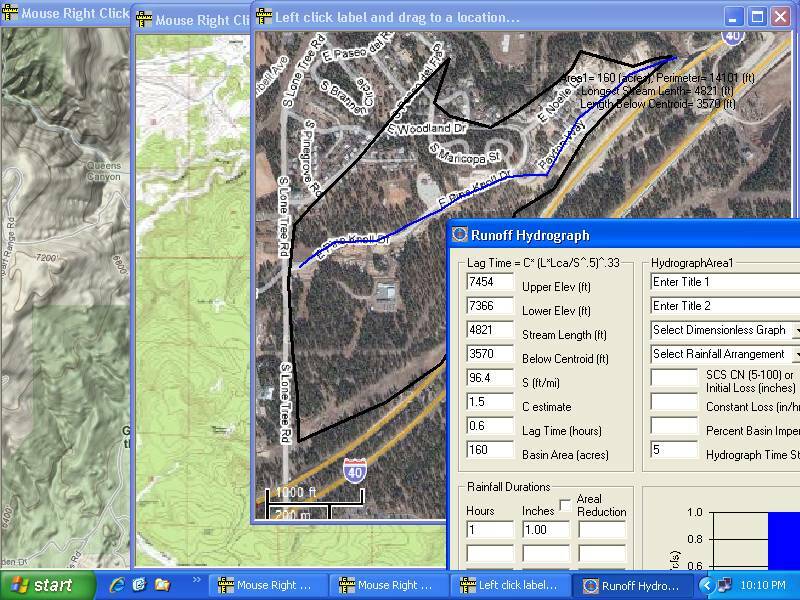 4) GetMapArea.exe 4.0.0--Defines drainage area boundaries and stream lengths with centroids on free topo map screens. Reads topo maps from Google Maps in full screen mode as a menu selection for dislplay and determination of Lat and Long. Also try the full screen USGS map viewer option in GetMapArea with Content, Base Data Layers = Hydrography checked. 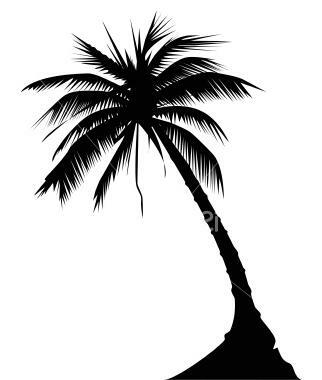 It's very buggy. Do not set scale with the scale legend, add 'Scanned topo' with 6 mile township or 1 mile section lines. Better yet, use the map viewers 'Find Coordinates' on it's tool bar to get diagonal Lat/Long scaling points, then digitize the boundary in GetMapArea using Lat/Long scaling, the preferred method. Buggy as it is, this will soon become your map source of choice for drainage areas. It is just amazing in how far free GIS info has come. Boundaries and lines are set by mouse clicks. Saves boundary and stream coodinates to text file and annotated map to jpg or bmp graphic file. Rainfall durations and runoff methods included. Help is available on its menu if you're Rational. Get MapArea quickly compares effects of dimensionless graph selection, lag, loss method, storm arrangement and routing method... and yes, I didnt forget the Rational Method... why I have no idea. ;-) Tatum's travel time, Muskingum, and Modified Puls routings included for routing and combining hydrographs saved to file. A triple triangular unit hydrograph method and a linear reservoir method have been added for calibrating rainfall runoff coefficients for GetRealTime.exe. Reads rainfall data from the GetAccess HDB database or text file. For an example of a case study you can follow for setting up GetRealtime for automated Nexrad Radar-Runoff computations go here. For a Youtube Video using Google Maps with GetMapArea go here. And for more great sources for maps, check out topo's and huc's on Google Earth at the bottome of this page. 2) Enter shifts to apply. Sheet4.Measurements. 3) Load field GH's to HDB. Sheet0.LoadHDB. 4) Enter GH corrections. Sheet6.GageCorrections. 5) Retrieve field GH's from HDB and apply corrections. Sheet6.GageCorrections. 6) Run primary computations on GH's. Sheet7.PrimaryComps. 7) Write final GH and Flow to HDB. Sheet6.GageCorrections. GetNexrad.exe is a tool used to view NOAA WSR-88D Nexrad doppler radar images and compute point and area average rainfall and to generate the basin point file used by GetRealtime.exe for automating computaion of a basin average rainfall time series in real time. Also NASCAR racing fans can try to out best crew chiefs like Larry McReyonlds about how near the rain is to the race track. GetNexrad will compute the ETA of rain cells arriving (and leaving) at the race track. Traditional area average rainfall is obtained by rainfall gages located in or near the area of interest and averaging the rain gage amounts using many methods. If you’re lucky you might find a rain gage nearby or you would have to install and maintain a network of rain gages yourself, The tools presented here will allow you to create point rainfall rates ANYWHERE in the US and greatly improve area averaged amounts and best of all IT’S FREE!!! The National Oceanic and Atmospheric Administration (NOAA) is a fantastic government agency responsible for the majority of the weather data and alerts in the United States. Using the publicly available and easily accessible reflectivity data from one of the WSR-88D class radar systems (NEXRAD), the tools presented here will show you how to choose a location and set up virtual rainfall collection for a precise geographical area. Please note that this is not a substitute for severe weather alerts issued by the NWS, but GetNexrad will even sound an alarm when alerts are issued. Software Requirements—GetMapArea is a must for creating the basin boundary except for point locations. Optionally for automating real time collection, storage, and display of the basin rainfall requires GetRealtime. These softwares are available online for free at GetNexradHelp . The WSR-88D class radar systems have many acquisition modes for developing precipitation. The most commonly used form of radar energy return mapping are the Base and Composite Reflectivity maps, and also the 1-Hour Total Precipitation. The 1-Hour Total image has had additional processing to better correlate with actual rainfall for different seasons and areas, but don't believe it. We can use any of these three images for the processing of localized precipitation information. 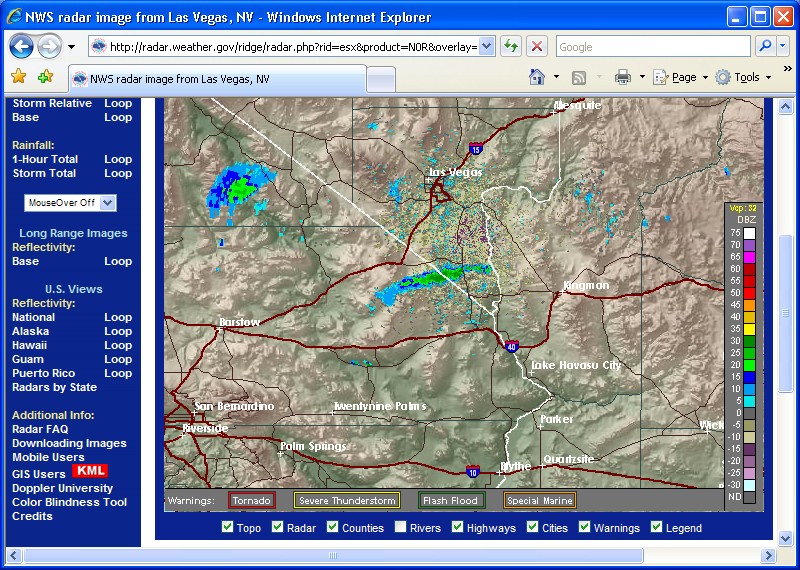 Click on the Las Vegas NV ESX radar point on the USA map Enhanced Version tab. GetNexrad will take the information in the NOAA N0R or NCR radar image and convert it to the one below where basin area average rainfall rate and point rainfall rate can be displayed. (rate >> inches for retrieval time step... knuckle head<<<me). The N1P 1-Hour Total is treated also as a rate of inches/hour in 5-minutes. After playing with GetNexrad, I hope you will take the next step in setting up GetRealtime to automate retrieval, storage, and display of your basin of interest’s rainfall amounts and learn how to compute runoff and route it. GetMapArea is an easy and fun way to get started computing runoff. For comparisons of Nexrad radar rainfall amounts to actual rainfall gage values go here. For comparisons of Nexrad radar rainfall-runoff to actual USGS gage hydrographs go here. Tired of those annoying commercials when listening to online radio on your PC??? Well, just set the times for turning down the commercial volume and then back up automatically. For you talk show enthusiasts just think of it... No more moronic public service ads from the nanny state at tax payer expense or top of the hour mainstream news propoganda. Nervana!!! If this Volumetimer.exe does not work for you try VolumeTimer2.exe. Creates a trapezoid channel's depth-flow-storage rating file used by GetMapArea.exe, GetGraphs.exe, and now GetRealtime.exe for their Modified Puls routing method. Includes optimized cascades. (Note: ChannelStorage and ModPulXsec use Manning's normal depth. ModPulXsec.exe should give the same results as Hec-1 or Hec-Ras given a steady flow value in cfs at 1 cross-section with a main channel and left and right bank over flow channels all the same length (sum of the 3 conveyances). ModPulXsec does not do multi-xsection energy accounting, just plain old normal depth. I found it to give the same results for modified puls routings for a single average x-sextion as a rating doing 20 x-sections in Hec-Ras. It depends on if you just want to route a flow or if you actually want to look at elevations at 20 x-sections up and down the reach..
ChannelStorage.exe is even simpler where a trapazoidle channel is given with normal depth.. If you have culverts and ponding and loop ratings with channel slope less than 10 ft/mile, GetRealtime can shell Hec-Ras unsteady flow projects and read the results back into GetRealtime. Creates a channel ModPuls rating depth-flow-storage rating file used by GetMapArea.exe, GetGraphs.exe, GetRealtime.exe for their Modified Puls routing method. . Includes optimal number of cascading reservoirs. Also computes Mukingum-Cunge K & X and it's cascades. NEXRAD Gif image files of Hurricane Alex as it came ashore June 30, 2010. Use GetNexrad.exe to view images as loops. Includes Brownsville, Texas KBOR radar gifs for N0R, N1P, NTP, NET, N0V, N0S... etc. every 5 minutes for viewing as 1-hour loops. 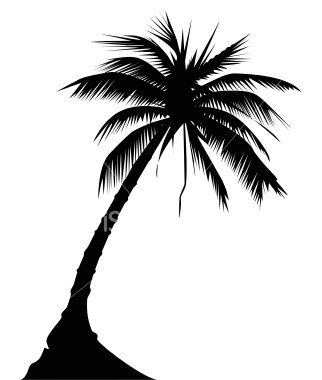 See HurricaneAlexReadMe.txt included for more info. The NTP storm total rainfall even as it just started to come ashore is amazing... to a desert rat. 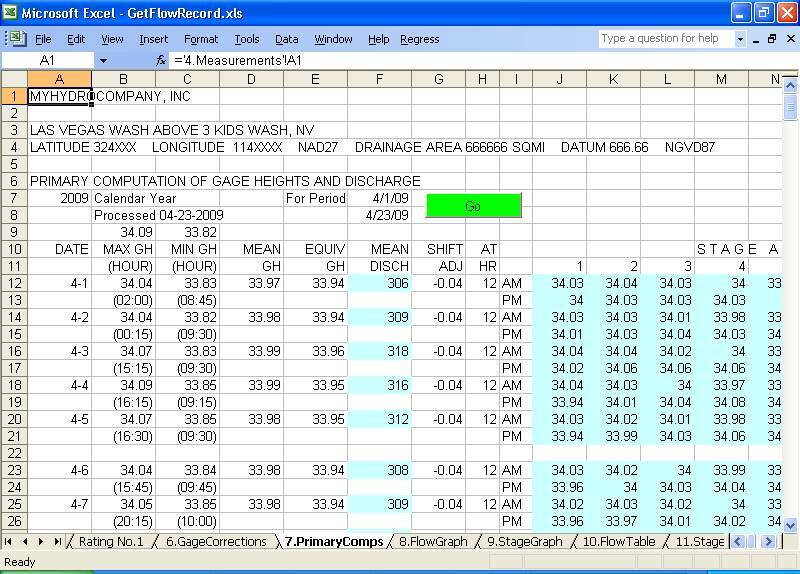 15 ExampleXLrangeToGif.xls--Excel VBA code example to convert your Excel data table or range to a Gif picture file and automatically send it to your Web Host directory. The GIF image greatly reduces the complexity of maintaining data tables on your web pages. 16 Oklahoma Tornado Level 2 Images--May 20, 2013 Oklahoma Level 2 debri ball sequence I downloaded with the NWS Weather Toolkit for display by GetNexrad. Always install GetNexrad in a separate directory for Toolkit images as opossed to real-time images to keep overlays seperated.